Does Asa have a life sentence doing time in the friendzone? Asa has been in love with Theo since their art school days in London, but Theo has only ever had eyes for their straight friend Oliver. Two years ago, unable to take the pain of unrequited love any longer, Asa came home to Glasgow. He hasn’t seen Theo since, nor has he stopped loving him. When Oliver marries Charlotte, Asa can’t come up with any reasonable excuse not to attend the wedding, so he returns to London. He isn’t exactly shocked when Theo doesn’t show up, but when he learns that the reason for Theo’s no-show is a car accident that has landed him in hospital, Asa immediately rushes to be with him. Unable to leave Theo to fend for himself while he recovers, Asa takes his friend back to Glasgow with him. There, secrets are revealed, and Asa learns more about Theo than he ever imagined. Cassidy Ryan is a new-to-me author. Our narrator – Asa is in love with Theo, while Theo is in love with their straight and getting married friend, Oliver. On way to the wedding, an accident places Asa and Theo together without interruption. 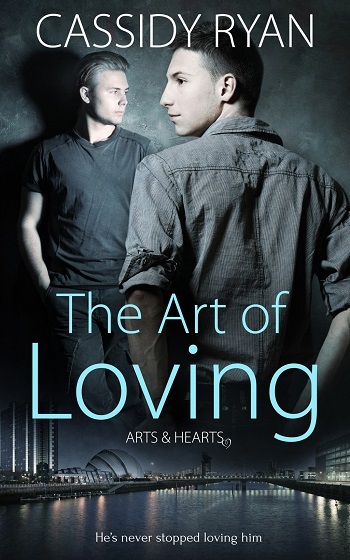 The Art of Loving was a quick novella, featuring the day-to-day goings on for Asa & Theo, with a few other characters shown. Not truly showing a romance budding, but there is definitely a buildup of 80% of the book before the characters admit feelings and take things into the bedroom. I need to mention the book ends at 90%, so it happened at the very end. While the book is most definitely going to please those who want to escape reality for a few hours, without much angst or any conflicts affecting the characters, those who are expecting deeper emotions may find it lacking. The between-the-sheets action is low on the heat scale, with only one scene. While I appreciate the story wasn't drawn out to satisfy page-count, the story itself was more of an overview instead of 'showing' the events as the story unfolded. Reviewers on the Wicked Reads Review Team were provided a free copy of The Art of Loving (Arts & Hearts #1) by Cassidy Ryan to read and review.